DAILY FIX: Each recipe in the Daily Fix line was developed to support a healthy, beautiful life with simple, effective ingredients you can trust. 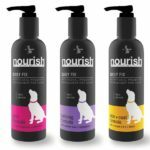 And with flavorful fish oil included in each recipe, these are delicious, good-for-you vitamins and minerals dogs will love as part of their daily health and beauty regimen. Made in the USA, Daily Fix offers three multi-functional recipes that address common health issues for dogs and also contains probiotics for ongoing gastrointestinal health. DENTAL CHEWS: These triple-action, dual-layer chews are packed with functional ingredients to keep dogs’ mouths and bodies healthy and happy. 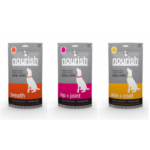 Nourish Dental Chews have two layers that combine beneficial dental ingredients with important functional ingredients. The exterior is a grooved layer made with new, triple-action Pecodent™; a proprietary blend of finely ground pecan shell, kelp and turmeric extract that provides natural fiber, helps clean teeth and freshens breath. Inside, each chew has a functional layer dedicated to supporting hip and joint health, fresh breath, or skin and coat health. These veterinarian formulated and developed chews make the job of cleaning dogs’ teeth easier and more powerful with the addition of functional ingredients.